Help Thomas, Percy, Harold and Byron get their jobs done by rail, air or road. Send them through the mountain tunnel, around the curves and over the suspension bridge. 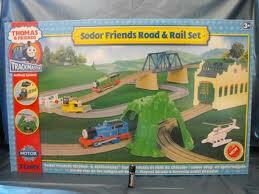 The Thomas Sodor Friends road and rail 45 piece set includes Thomas, Percy, Harold, Byron, mountain tunnel, suspension bridge, railroad crossing, engine shed, helipad, road, rail track and buffers.